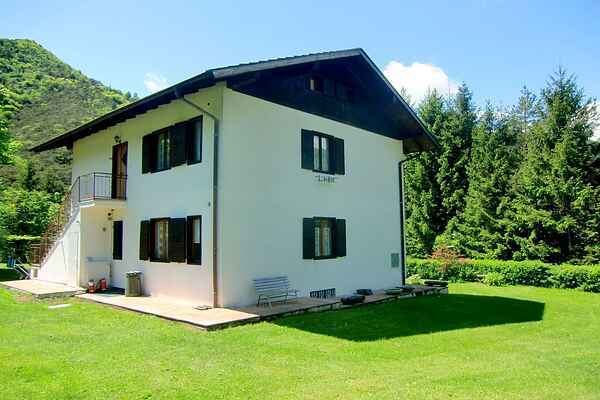 This house is situated in Val Casarino, a side valley of Val di Pur, in only 900 m distance from Lake Ledro. The house is located in a sunny position in the nature. It's composed of 2 apartments, with a big garden, equipped with playing equipment for children, tables, chairs and barbecue for the guests. Inside of the garden there is a parking area for the car. The garden is equipped with grill, tables, chairs, lounge chairs, playground and car parking. A short walk through the wood will lead you to the lake, which is easily approachable by foot or by bicycle. In the surroundings is situated a farm where berries and medical plants are cultivated according to biologic and biodynamic methods, at about 500 m distance you will find the new art project „Ledro Land Art“, and at 300 m distance is located Hotel Maroni where you can enjoy a Pizza or other local specialities or only have a tennis match.